As with any resignation there are a thousand small, but nevertheless important questions. Most are of the who-knew-what-and-when variety. But with this astonishing fall from grace there is one big overarching question. I'll save that best bit for last. What happened to the advice given by the acting attorney general to the White House counsel cautioning that Gen Flynn had not been entirely honest. Was the president aware of this? Were there different factions operating within the White House yesterday with different agendas on the embattled national security adviser's future? Then we can go a sub-section of those questions which revolve around management at the White House. The seemingly dull-sounding process questions: What are the lines of communication? Who reports to whom? If that all sounds rather trivial, ask this - how was it possible that within a single hour yesterday afternoon Kellyanne Conway, counsel to the president, said Mr Flynn enjoyed the full support of Mr Trump, and then shortly afterwards, Communications Director Sean Spicer said the president was evaluating Mr Flynn's position? Those just aren't reconcilable statements. Who was speaking on whose authority? This is not good communications strategy; this is what shambles looks like. Is US heading for constitutional crisis? And let's deal with one bit of smoke that has been thrown up since the resignation. Kellyanne Conway was across the US networks this morning with a simple and tempting argument - what sealed Flynn's fate was his misleading of the vice president over the nature of his conversations with the Russian ambassador. That resulted in Mike Pence going on TV in the middle of January and saying: "It was strictly coincidental that they had a conversation. They did not discuss anything having to do with the United States' decision to expel diplomats or impose censure against Russia." Of course, you can't lie/mislead/deceive/inadvertently misreport to (delete as appropriate) the vice president. But, if you draw yourself a little timeline of what happened then, what is striking is this - it is not the lie/misleading/deception/inadvertent misreporting that cost General Flynn his job, it is the lie/misleading/deception/inadvertent misreporting being made public by the Washington Post that cost him his job. We now know the acting attorney general went to the White House weeks before to say voice intercepts of Gen Flynn's call proved that lifting of sanctions was discussed. But no action was taken then. Only when it blew up did this become an issue. This conforms to the little discussed 11th Commandment that Moses handed down on his tablets of stone: Thou Shall Not Get Found Out. But let us move on to the really big question. What does this say about President Trump's relationship with Russia? For a man who at the drop of a hat will freely spray insults on Twitter to anyone and anything, the one person he stubbornly refuses to say a bad word about is Vladimir Putin. Not ever. In one recent interview he seemed to suggest that America as a state had no greater moral authority than Russia. It was the doctrine of American Unexceptionalism, if you like. 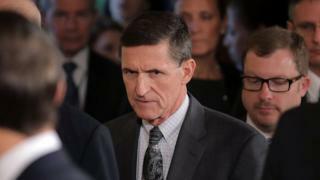 Michael Flynn had sat with the Russian president not that long ago at a dinner honouring the pro-Moscow TV network Russia Today. Extraordinary that a former three star US general would be there. A dossier drawn up by a former MI6 officer - that was flatly denied - alleged all manner of Russian involvement in President Trump's businesses and presidential campaign. Make no mistake, the Trump base love what they've heard about the migrant ban, the eviction of illegal immigrants, the jobs pledges and a lot more besides. But what causes a lot of people to scratch their heads is why the love-in with Putin? What is driving this? Even if the most lurid things in the dossier were untrue, are there other things that are? Does Putin have some kind of leverage over the new American president? The smaller questions, like they often do, will fade away with the next news cycle. These huge ones won't.